We still have some places available at our training next week. If you work with young people, you should definitely get along to one of these sessions, to get some knowledge on how to include young people with a disability in mainstream activities. You don't have to be working with people with disabiltiies at the moment - you may be a youth worker or work at a group or club and want to be more inclusive in your role. There are two locations to choose from so get in contact and book your place! This is a workshop that explores the ways we define professional boundaries in our work through a discussion based learning experience, with some handy hints, ideas to challenge our ways of thinking and a chance to be open with our questions regarding boundaries. 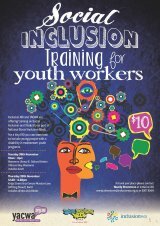 Our flagship workshop has been educating and informing thousands of participants all throughout WA. Here we will explore "the good life", what it means for us and the people we work with, and how we can best contribute to supporting the development of community connections in unique and creative ways.